We at ShopJeepParts.com are committed to providing you with the highest quality Jeep Parts and Jeep Accessories at low competitive pricing. Please make sure you Join our email list so you don't miss our latest deals! Most of the time, we already have the best price so we recommend No need to waste your time shopping around looking for the best deals. 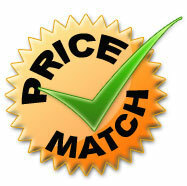 Once in a while, it is possible you will find a lower price online somewhere else. If you do, please contact us and tell us where you found a better price and usually we will have no problem with PRICE MATCH and in most cases BEAT IT! Please give us a chance to earn your business. Please Note: Every effort is made at our end to meet or beat competitors price however there will be times when we will not be able to honor price match request. We do apologize for such cases in advance and do reserve the right to refuse a price match that does not make good business sense.